Onion has been used for over 5,000 years for both its versatile flavor and medicinal benefits. This vegetable has compounds that work as a natural antibiotic. Onion, a vegetable originally from the Eastern Mediterranean, has been one of the most popular culinary additions around the world. Widely regarded as a staple food during the Middle Ages, the bulbs were used to pay house rent and for treating many health conditions. Nowadays, onion is found in cupboards and cuisines across the globe, and it has also been recognized as a source of medicinal benefits. Treating respiratory infections. 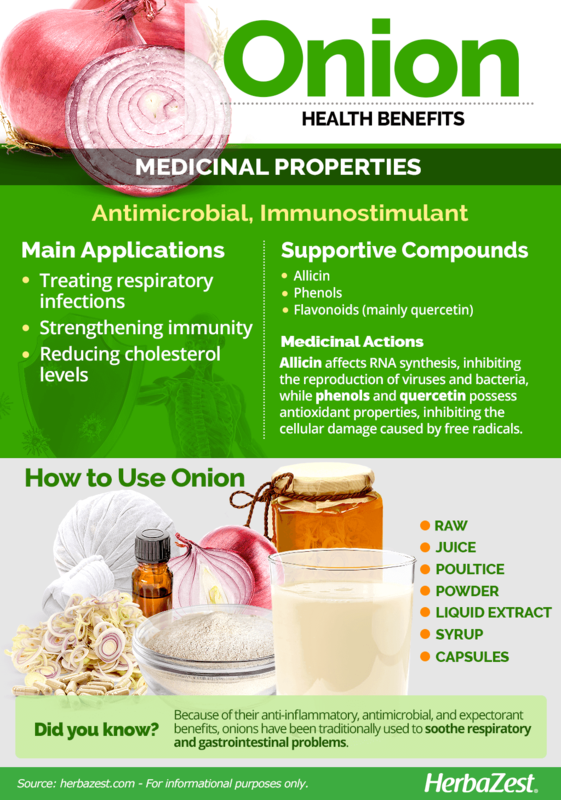 The antispasmodic and antimicrobial properties of onion have been used for thousands of years to treat all kind of respiratory diseases, from asthma and bronchitis, to common cold and flu. Strengthening immunity. Onions have the ability to stimulate immune response, which protects the human body from the attack of harmful fungus and bacteria. Reducing cholesterol levels. The sulfur compounds in onion have proven effective reducing the production of unhealthy cholesterol in the body. Additionally, onions are thought to be helpful for promoting cardiovascular health by improving blood circulation, regulating blood pressure, and reducing the risk of blood clots. The main active ingredient behind onion's medicinal benefits is allicin, a sulfuric compound that's abundant across Allium species. Other phytocompounds found in onions include phenols and flavonoids, as well as quercetin and alliinase. Allicin affects RNA synthesis, inhibiting the reproduction of viruses and bacteria, while phenols and quercetin possess antioxidant properties, inhibiting the cellular damage caused by free radicals. The absorption rate of onion's quercetin is twice that from tea plant and more three times that from apple. Promising studies have concluded that onions can be useful to reduce hypercholesterolemia in liver inflammation. It has been shown that consuming onion produces changes in the metabolism of fatty acids, aiding recovery from oxidative damage due to excess of cholesterol. Additionally, onion extract has proven effective in controlling blood sugar and cholesterol levels in women with gestational diabetes. 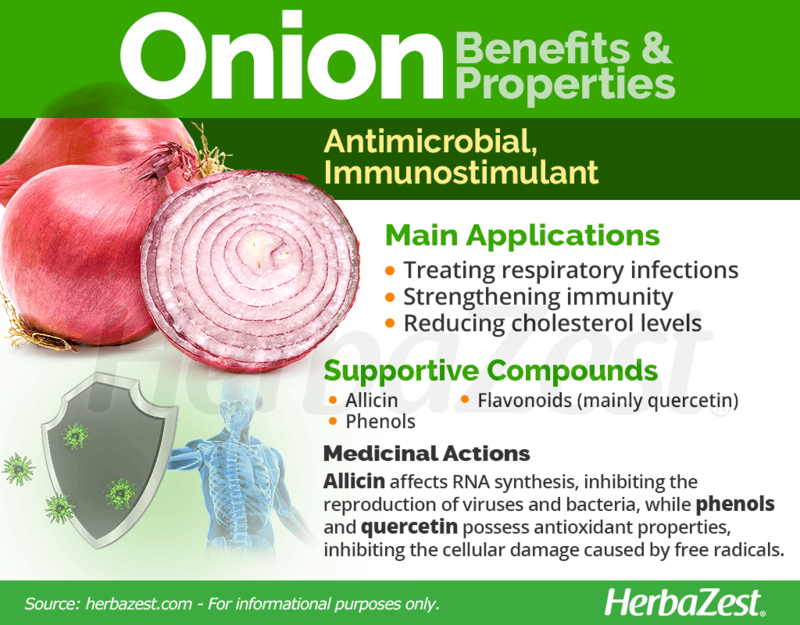 The main active ingredient behind onion's uses is allicin, a potent antibacterial and antiseptic agent. Strong antibacterial properties can be found in garlic, whereas olive and sacha inchi also support cardiovascular health. However, onions also carry an unpleasant side effect of irritating the eyes and triggering inflammation of the tear glands. Allinase is an enzyme that interacts with a sulfur compound called alliin when the onion tissue is damaged, generating different sulfenic acids, which are responsible for making people cry when chopping the raw bulbs. Onions also can cause headaches and flatulence in sensitive people, particularly those suffering from irritable bowel syndrome (IBS). Diabetics taking medication should also be wary when consuming onion, because it can potentially lower blood sugar levels to the point of causing hypoglycemia. Onion doesn't need to be completely avoided during pregnancy and breastfeeding; however, it shouldn't be consumed in large amounts. Onions have been a staple food in major civilizations for a good reason. They are not only low in sodium and contain no fat, but also provide adequate levels of dietary fiber and essential nutrients, such as vitamin C (ascorbic acid), vitamin B6 (pyridoxine), and vitamin B9 (folate). Additionally, onion bulbs contain small amounts of potassium, calcium, and iron. 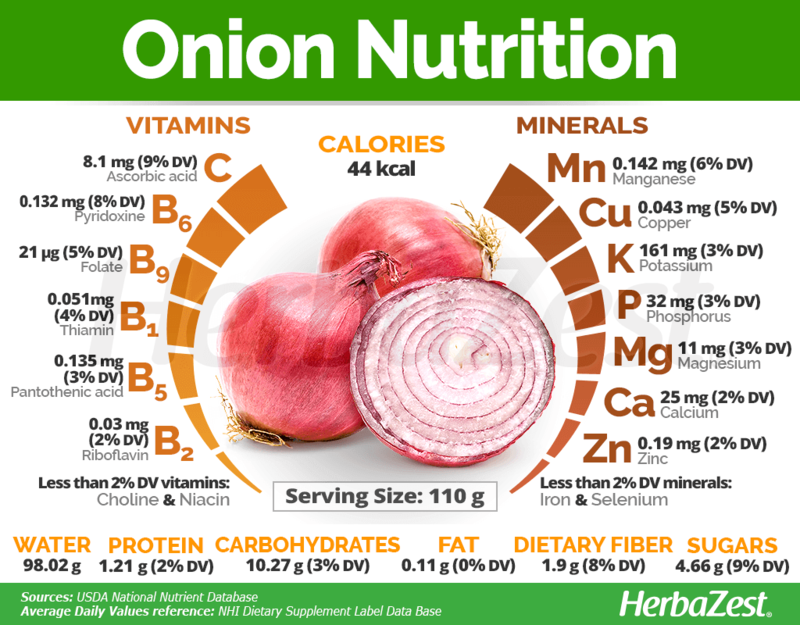 A medium sized onion (110 g) provide 44 calories and zero fats, as well as 8% of the daily value for dietary fiber. Onion bulbs in particular are highly regarded by both chefs and traditional regional cooks alike as a flavor enhancer for salads, sandwiches, stews, and many other types of preparations. However, herbal remedies concentrate the medicinal benefits of onion. Raw. Freshly chopped onions can be consumed in salads. Their anti-inflammatory, antimicrobial, and expectorant benefits can be used to soothe respiratory and gastrointestinal problems. 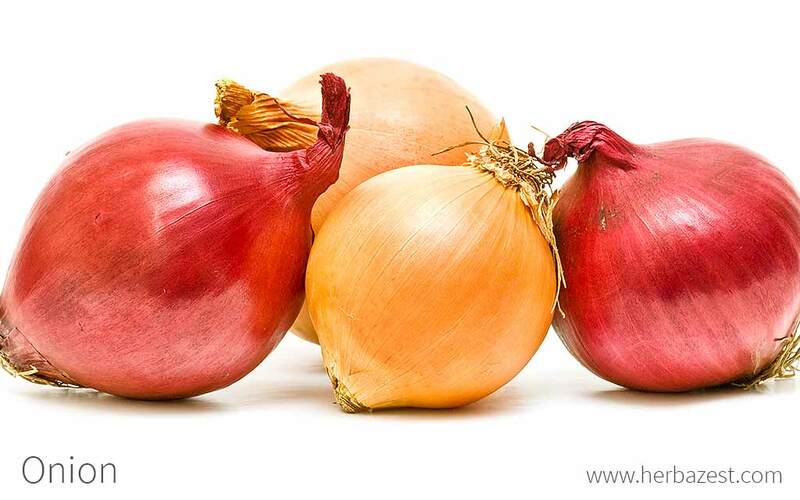 Raw onions are also used topically to eliminate warts. Juice. 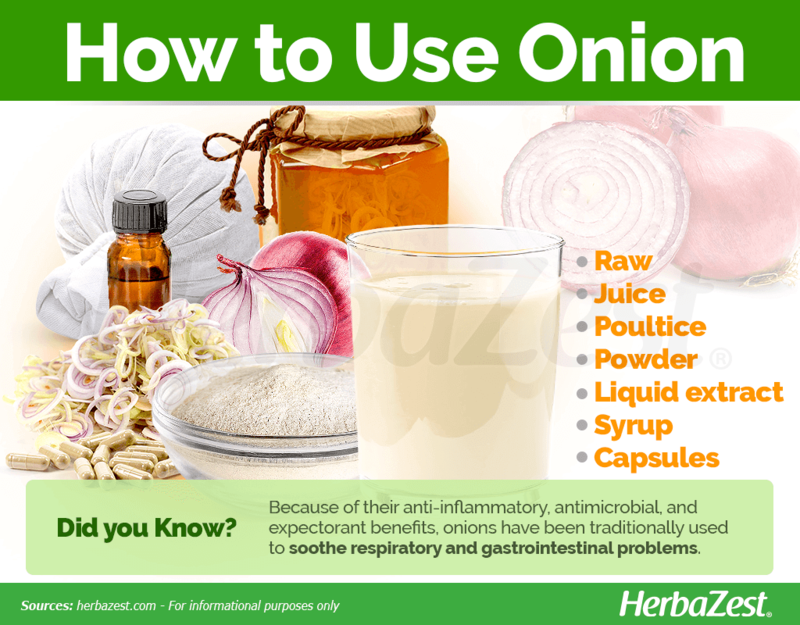 Onion juice has been traditionally used as an antiseptic and antimicrobial agent for the treatment of wounds and infections, as well as for relieving fever, catarrh, bronchitis, and cough. When used topically, onion juice can soothe the inflammation caused by insect bites and bee stings. Poultice. Crushed raw onion can be applied on the forehead to reduce headaches, and a paste made of roasted onions can be applied over boils, bruises, wounds, and scraps. Powder. The dried and finely ground onion bulbs preserve most of the properties of the herb, and can be used with the same purposes, in both culinary and remedial forms. Liquid extract. The crude, concentrated extract of onion concentrates the antimicrobial, expectorant and anti-inflammatory properties of the herb, and needs to be diluted in water for oral consumption. Syrup. This remedial preparation often comes mixed with other herbs, and it is commonly taken by spoon for the relief of respiratory diseases. Capsules. This supplemental form, ideal for those who dislike the pungent smell of onions, provides the immune stimulant and antimicrobial benefits of the herb in standardized daily doses. Raw onion is easy to find in most grocery stores or local markets throughout the year. The most common presentation of raw onion includes the whole unpeeled bulbs, which can then be peeled and chopped to be consumed raw or cooked, depending on individual preferences. Onion powder can also be found in supermarkets or purchased from online retailers. Remedial forms of onion can be found in specialized health stores. In addition, there is a wide variety of onion supplement choices available through online retailers. Onions are best grown in similar conditions as garlic and other members of the Allium genus. Onions need sufficient exposure to cold temperatures in order to enhance the bulb's pungency and its antibiotic properties. Onions should be grown from seeds, planted in rows, and should be germinated at 45 - 95°F (7 - 35°C). Drip irrigation is the most appropriate system for growing onions, and they require replanting every year. Onion is an annual bulbous herb that is now grown extensively around the world, mainly for culinary purposes. The fleshy bulb is formed by dense layers of leaf bases, which contain the nutrients responsible for the onion's medicinal benefits. Onion (Allium cepa) is a member of the Amaryllidaceae family. This family contains approximately 1,600 species of herbaceous, bulbous flowering plants. Onion also belongs to the Allium genus, which notably includes garlic (Allium sativum), leek (Allium ampeloprasum), and chives (Allium schoenoprasum), all of them with a pungent odor, related to their medicinal and culinary properties. Over the course of history, different varieties and subspecies of onion have been cultivated through selective breeding in different regions of the world. The most common varieties are part of the common onion group. Plants in this group form large, single bulbs. There are also several European onions, which have protected geographical status. Ancient Egypt was reportedly the first civilization to domesticate onion approximately 5,000 years ago. Documentation reveals that the onion was worshiped for its spherical shape and was considered a symbol of fertility. Experts also believe that onions were used for paying construction workers. In ancient Greece, onions were consumed for their medicinal benefits, as they were thought to "lighten" the balance of blood. Roman gladiators used onions to enhance muscle firmness. Onions are mostly valued for alimentary and culinary purposes. Over nine million acres of onions are grown throughout the world annually. They are now grown by 170 different countries for domestic use, and about 8% of onions are traded internationally. China is currently the world's largest producer of onions, harvesting over 20 million tons each year. India and the United States take second and third position. Gardening. Despite the pungency of its bulb, the onion plant have beautiful white to purple flowers, and it is a popular ornamental in home gardens. Cleaning. Onion can remove rust from kitchen utensils by rubbing them against a bulb cut in half a few times.